In the aftermath of "Superman Reborn" it is what Kryptonians call the Day of Truth. Kara Zor-El and readers who may not have read that serial learn what happened to Superman. 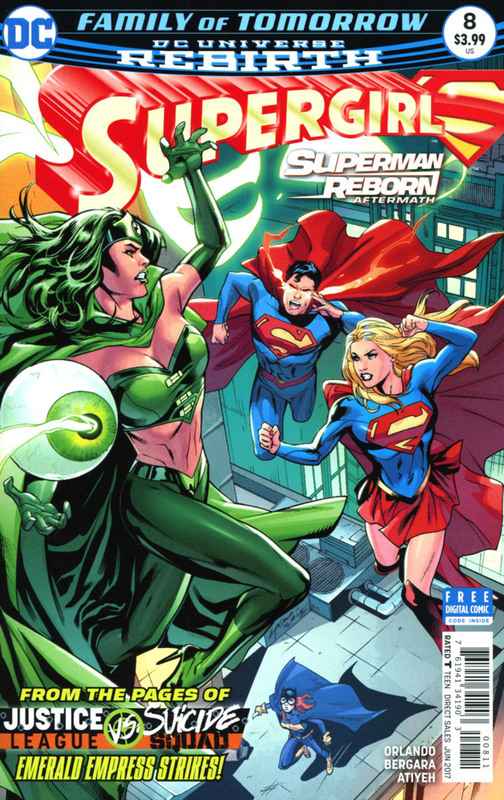 He and Supergirl fight Emerald Empress, who has a grudge against the Girl of Steel for something she has not yet done. Kara never met the empress before this issue. After using iron to defeat Emerald Empress' magic, Supergirl spends some time with Clark, Lois and Jon for family bonding. It is then that Clark tells Kara that the true mastermind behind the events of "Superman Reborn" is out there somewhere, and he may need her help to combat him. Some days have passed in National City. CatCo and the D.E.O. are after the same thing without realizing it. The former wants the scoop of the century, while the latter wants stolen technology. Tychotech is the company both Cat Grant and Cameron Chase want to investigate, and National City will soon see the shadow of the bat. Story - 5: This is a story that is long overdue. It's taken a while for this series to find its legs, but we finally have an issue chock full of wonderful character moments and superhero action. 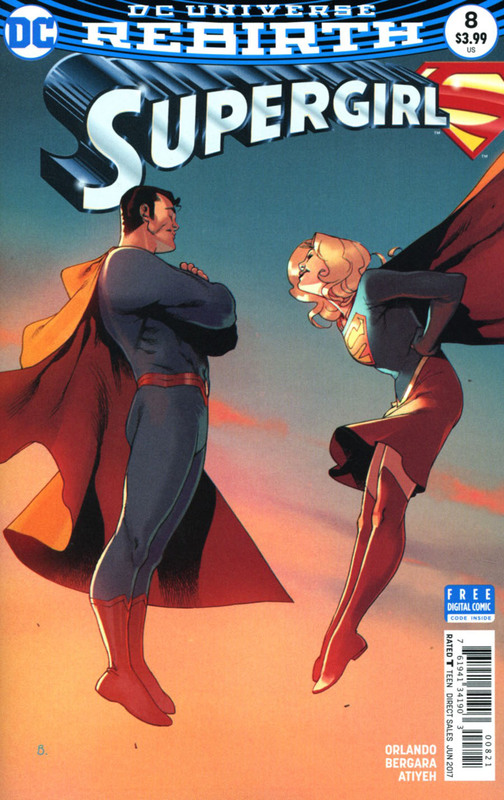 Plus, Superman and Supergirl are together again in a story after what feels like a century. I want to see more with Lois, Clark, Jon and Kara in future issues. A holiday story with the Kents and Danvers families together is on my mental wishlist. One thing that I'm hoping is not a red herring is Emerald Enchantress' claims that Kara "ruined her life". It would make an interesting mystery plot thread to put in the final pages of about four to six issues before putting it into a full story arc. If it's been mentioned in other comics, I apologize. I just haven't had the time to read as many titles as I used to due to writing deadlines on various projects. Anyway, DC better bring back the Enchantress in future Supergirl comics. Overall, I loved this issue. It was very reader friendly filling in readers on the "Superman Reborn" story, and Steve Orlando has finally gotten a good grasp on the characters and action after a bumpy beginning. If next month's comic is like this one, we'll be in for a real treat. Art - 3: There are times when Matias Bergara's art style reminds me of the great Sal Buscema. Yet, there are other moments when his images look, for lack of a better term, too cartoony for a Supertitle that isn't based on an animated series. Still, it helped to tell the comic's story without distracting too much from the full finished product. Cover Art - 4: It feels like Emanuela Lupacchino put a little too much into one image of what is an otherwise superb cover.